Ollie, Poppy and Jack were the stars of the documentary. We cried tears of sadness and fear as we watched just 3 families within our community and their education struggles. It reminds us why we do what we do! We know this is just the tip of the iceberg as these scenarios are replicated 100s of times over throughout South Glos. Find out more about what we are doing and how you can help. We know from the conversations in our closed Facebook group for Parents & Carers in South Glos that so many of us have been following the documentary series that is giving real insight into how the issues of decreasing education budgets impacts the day to day management of school life in South Glos. It has been really moving to watch the seldom seen struggles and perspectives of head teachers, teachers and teaching assistants as they strive to make improvements and do the best for their pupils in a climate of ever dwindling funding. Tuesday night’s episode focused on SEND issues and as you can imagine, we all tuned in eager to see the children within our community and how budget cuts are impacting our children in mainstream settings in South Glos, a notoriously very low funded Local Authority. We have great sympathies with the teaching assistants and teachers as in previous episodes but at the same time, we have some questions and thoughts about what we saw. Many of us cried, as did some of the teaching staff in the documentary, when we heard and saw that inclusion in mainstream settings may not be an educational choice for some children in certain schools in the future due to funding and the schools inability to meet needs. To hear it said that schools may no longer be willing to accept children of a certain level of additional needs like Ollie who has Downs Syndrome is saddening and scary, especially whilst we know the results of the consultation on schools and SEND budgets will only lead to more cuts. 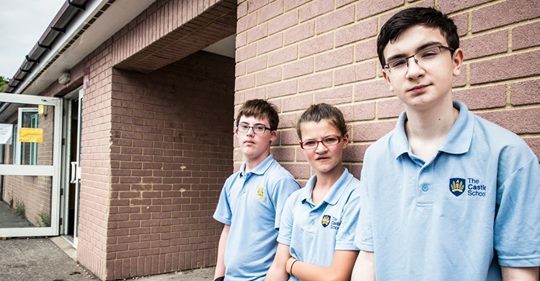 Inclusion means so much to families and pupils such as Ollie and is something that has been heavily promoted in recent years as a positive and the correct path wherever possible, and now, many of these children have got so far through the system, sometimes with the support to help them succeed. Others spend years battling to get it such as in the case of Poppy, and now find that what they need will be taken away and replaced by group setting support that cannot truly meet their needs. Removal of choice for parents and carers as to the best environment for their child’s education feels like a huge step backwards to a time where young people with disabilities were all but invisible and not included in community life. No time was allowed for Jack to process the auditory input of multiple questions. Basic language processing stuff. He was asked questions whilst being asked to look at and take in visual input of a graph and statistics. Sensory overwhelm. He was asked to identify his feelings and their sources without support, something that is so difficult for children with Autism and for those with anxiety. No time was given to picking this apart to explore the reasons for the needs that are being communicated through Jack’s behaviour, to use the iceberg analogy, the two thirds below the surface was left unaddressed whilst all focus was given to what is visible - the behaviour. All behaviour is a form of communication. No discussion of needs or what accommodations could be made and put in place to support Jack to help him feel safer and calmer at school. No arrangement was made to take the time with Jack to explore his needs in a less time pressured moment. This is all pretty simple and cheap stuff actually, if time is taken where it is needed and could prevent a demand in other areas of services and reduce stressful situations such as the possible prosecution of Jack’s mum. Funding: the notional SEND budget. There is only so much you can cover in a documentary but we would have like to have seen a discussion with those in charge of finances about the notional SEND budget. The notional send budget is the name of the £6 thousand additional funding a school gets for having a child with SEND enrolled to help with the additional costs of meeting their needs. In 2014 this was un-ringfenced so effectively, schools can move this money to whichever budget they decide. The rub comes when additional funding is applied for to assist a given child, the local authority want to know before more money is given exactly how the £6000 has been used to benefit and support that child specifically. This seems only fair as £6K is quite a lot. Schools should be accountable for demonstrating how this notional SEND budget is spent. In reality a lot of us know that the money is often spent elsewhere in a manner that doesn’t always directly and specifically benefit the child for which it was awarded. With many of us being refused support such as paediatrician requested assessments of our children by educational psychologists for example, we really should know how that £6K is being spent. If you agree, read on to find out how you can help. NB: We are seeking clarification on our understanding of the notional send budget so that we can better understand it and clarify it for our community as there is a lot of confusion on the is topic. We will be in touch on this shortly. Whose heart did not go out to Jack’s mum Mel while she struggled with her child’s school related anxieties and school refusal? So many of us have been there and it brought back so many memories, the stress and desperation was palpable. It is shocking that it reached such a threatening stage for an already under pressure family. One thing that struck us, and it relates so much to the experiences we have had and heard, the request for evidence from a specific - and often uncontactable due to waiting lists - source. No evidence was not true. Jack’s behaviour is communicating his needs and is evidence. A piece of paper from a professional deemed trustworthy enough to confirm what is obvious doesn’t change Jack’s needs and does not explore how best to support them. Scaring parents who are struggling does not improve the situation whereas meeting needs will. We were so pleased that Mel, Jack’s mum was not prosecuted. We are so grateful to and impressed by the parents and young people who took part! The parents and young people who took part and let the UK take a peak into their homes and their daily lives and struggles, hope and fears so openly and honestly were amazing, we think you are all so brave. We feel huge grattitude for the willingness to put yourselves in that situation for a greater understanding of individual SEND and our community’s day to day experiences and highlighting some of the big issues our SEND children face in education. What we are doing for our community and how you can help. Beyond our usual advocating the views of community there are two specific ways that we and you our community can help around the issues of SEND budgets. We have been asked as part of the National Networks of Parent Carer Forums to complete a survey that is to be fed back to The National Audit Office to assess whether the Department for Education are supporting students with SEND effectively. We want to give them accurate data based on your views, not just our recollections of Facebook discussions and the difficult stories we have heard at our groups and through people we have met. Complete our short survey and we will feed the results back into this survey with a report that highlights all of your responses. This would be a huge help. We are looking for motivated Parent Reps who can commit to representing our community. We are joining th High Needs Funding Working Group that we will taking part in with Mustafa Salih, Head of Financial Management and Business and Duane Chappell, Strategic Lead SEND (education) of South Gloucestershire Council and we have parent reps on board. Do you want to make a difference to how SEND funding is used within our schools? Can you regularly commit to being a parent rep where we are involved in areas such education & social care? We want to hear from you! Email our team on: team@sglospc.org.uk to express an interest and find out more. Working Co-productively to explore the challenges faced by parents and carers and services alike to find a way forward that benefits our community. Working co-productively with education, health and social care services is what we do and at our very core is a drive to improve things for our young people and families in our community through particpation. We are great at understanding the perspectives of services and especially at understanding the experiences of our community (that often we have shared ourselves). We know things are difficult, times are challengin and we are realistic. We are committed to working with all services and parents and carers to find ways forward through all of the challenges to improve access to and experiences of services for our community. Our community is always at the heart of what we do, it is our reason for being and our every motivation. Older PostOur Understanding and Supporting Behaviour workshop pilot was a great success!